The H-2A guestworker program provides an unlimited number of temporary work visas to agricultural employers to hire farmworkers from abroad to fill temporary or seasonal jobs lasting for less than one year. Last year, over 200,000 H-2A jobs were certified by the U.S. Department of Labor (DOL)—the most ever—despite the many abuses and exploitation that continues to occur at the hands of employers and labor recruiters. Members of Congress are currently negotiating and debating the fiscal 2018 omnibus appropriations bill to fund the federal government, and hope to pass it before the current temporary spending bill expires on March 23, 2018. On the table is a proposal to allow employers to use the H-2A program to fill year-round, permanent jobs in agriculture with H-2A workers who have few rights and no path to permanence and citizenship. It was first proposed in July 2017 by Rep. Dan Newhouse (R-WA) but never became law. We have already explained why making H-2A year-round via appropriations is a bad idea, but one other major consequence that Congress should consider is that it will result in allowing agricultural employers to pay much lower wages to H-2A workers in year-round jobs than they pay to the Americans and immigrants who are currently employed in those jobs. Making H-2A year-round would expand the scope of H-2A by allowing employers offering year-round employment on dairy, livestock, and poultry and egg farms, as well as in nurseries and greenhouses and other non-seasonal agricultural occupations, to hire H-2A workers—bringing H-2A workers into sectors that offer approximately 260,000 year-round full-time equivalent (FTE) jobs. Table 1 lists some of the main year-round agricultural industries in major agricultural states, accounting for 123,000 of the 260,000 full-time equivalent jobs, and shows how much farmworkers earned annually, on average in 2016 in those occupations (according to the Quarterly Census on Employment and Wages, from DOL). Unless there is an applicable local prevailing wage that is higher, the Adverse Effect Wage Rate (AEWR), set by DOL every year, is normally the minimum wage employers must pay their H-2A workers. The purpose of the AEWR it is to ensure that H-2A workers are paid a wage that is high enough to avoid adversely impacting the wages of farmworkers in the United States. In Table 1 we compared the annual earnings of farmworkers in the listed occupations with what H-2A workers would have earned if they worked the same jobs and were paid the corresponding 2016 AEWR hourly wage for the entire year (40 hours per week for 52 weeks). The data reveal that many of the farmworkers in year-round jobs earned much higher wages on average over the course of the year than they would have earned if they were being paid at the AEWR hourly rate (see Table 1). Source: Quarterly Census of Employment and Wages, Bureau of Labor Statistics, U.S. Department of Labor; Adverse Effect Wage Rate (fiscal 2016), U.S. Department of Labor. If the H-2A amendment becomes law in the fiscal 2018 appropriations bill, employers will be able to hire H-2A workers in these year-round jobs—in industries like poultry, mushrooms, dairy and hog farming, and greenhouse and nursery production—but will only be required to pay them the AEWR wage. As a result, employers will end up paying year-round H-2A farmworkers thousands of dollars less per year than they currently pay to the workers in these jobs. 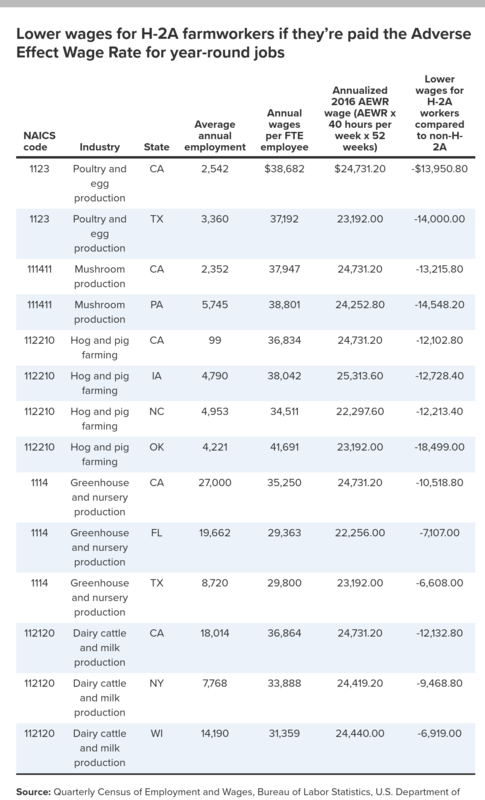 The reduction in wages for H-2A farmworkers as compared to the current going rates in Table 1 would range from $6,608 less per year in greenhouse and nursery production in Texas, to $18,499 less per year for hog and pig farming in Texas. Such an outcome would be inconsistent with the intent of the AEWR and the H-2A statute, and hurt some of the most vulnerable and lowest paid workers in the U.S. labor market. It would also create an incentive for employers to replace their current workers with H-2A workers who can’t switch employers or effectively complain when their wages are stolen or when they’re forced to work in unsafe conditions. Instead of finding ways to pay farmworkers less and to keep them indentured through H-2A program, members of Congress who want a stable farm labor force should pass legislation that legalizes undocumented farmworkers and puts them on a path to citizenship, and raises their wages. And rather than trying to fill permanent jobs with temporary H-2A workers, Congress should reform the H-2A program so that it gives migrant farmworkers equal rights and provides them with an eventual path to permanent residence and citizenship.